With their first cigar release in 1985, Robert Levin and Ashton Cigars have been about dependability and consistency—consistently rich, dependable quality and with tastes you can trust. Levin knows cigars, and he knows the cigar business—much of this knowledge was learned from Holt Cigar Holdings. With a start sweeping the floors and soaking bricks for an early version of a humidifier, Levin learned many basics while working in his father’s retail store. After taking over the family business in 1970, Levin’s focus shifted to becoming a distributor. Not liking the competition and low reward, Levin set his sights on other things—creating a cigar that brought something new to the table. With 30 years of knowledge, Levin knew what he wanted to create – something new for the cigar world. With a focus on more flavor and taste, Levin began sampling cigars and wrappers to hone in on the perfect combination. The next step? Finding the manufacturer that saw his vision. That was Henke Kelner (before he became a part of Davidoff) and Tobacos Dominicanos. Even with all his experience, the start was slow. After two to three years, Levin turned to a family of manufactures that would ultimately change the face of Ashton Cigars—the Fuentes. With Levin’s vision and the Fuentes experience since 1912, the Ashton Cigar brand exploded and continues to enjoy the same success after 24 years of partnership. 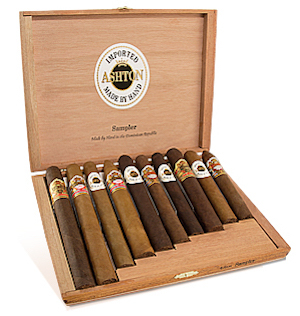 In 1985, Ashton Cigars came out with its first cigar in six sizes: Chruchill, Corona, Panatela, Prime Minister and Sovereign. These sizes still remain today. 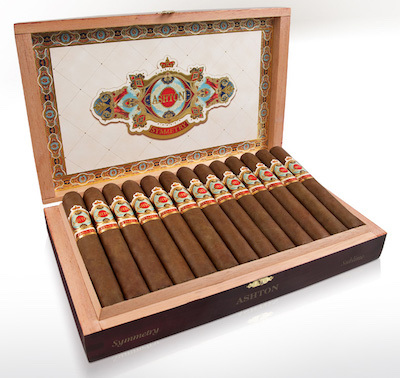 Ashton Cigars has focused on two things: new, bold cigars and old favorites—including La Aroma de Cuba. After researching old Cuban cigar lines and discovering La Aroma de Cuba’s disappearance, Ashton obtained original artwork and re-released the line after being off the market for over 100 years. Ashton’s respect for old favorites coupled with fresh and bold ideas has solidified Ashton as a well-known and respected cigar line. This is clearly seen with numerous accolades and awards, including a number of appearances on Cigar Aficionado’s coveted Top 25 Cigars list. Every year, Cigar Aficionado releases a “best of the best” list. The first time you see your name on the list—you know you have made it. Some companies grace the list multiple years, a definite accomplishment. But, to make the list every year since 2004, most as top 10 spots—that is something else entirely! While Ashton Cigars offers an array of sizes, flavors and experiences one truth has always stood— trust your taste. Ashton won’t lead you astray.